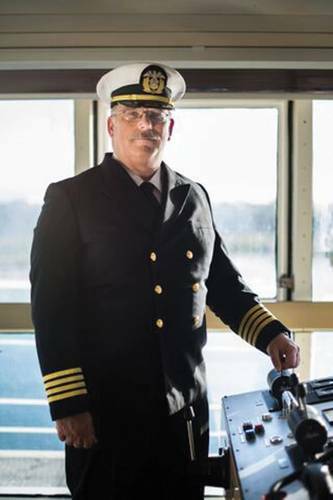 Captain Tim Tretheway’s selfless journey at sea spanned almost 30 years and helped to change literally hundreds of thousands of lives – for the better – in the process. Captain Tim Tretheway’s career path, especially viewed from today’s sometimes mercenary maritime business climate, can be safely characterized as unusual. Rising up from the foc’sle, Tretheway also eventually plotted a professional course line that took him to virtually every corner of the globe. And, unlike today’s mariners who demand – and get – top dollar wages in most disciplines, Tretheway has largely toiled for the intangible reward of serving the greater good. If there is a more unusual and compelling professional story on the water today, then it hasn’t yet crossed my desk. The current vessel was acquired in 1999 through a donation from the Balcraig Foundation. The former Danish rail ferry Droning Ingrid was re-named the Africa Mercy in April 2000. A £30 million refit was funded by donations from the Oak Foundation and continuing support is received from the Balcraig Foundation and other Trusts, corporate gifts-in-kind and individual contributors. Tretheway told MarPro in August, “In the Mercy Ships sense, ‘volunteer’ means someone who steps up and says, ‘I want to be a part of impacting the world, of doing some real good, with my professional skills beyond keeping the world economy working.’ It means finding the means and time to come, for whatever time one has available, to be a part of something bigger than self, something so deep that a child has a future or an old man first sees his grandchildren. 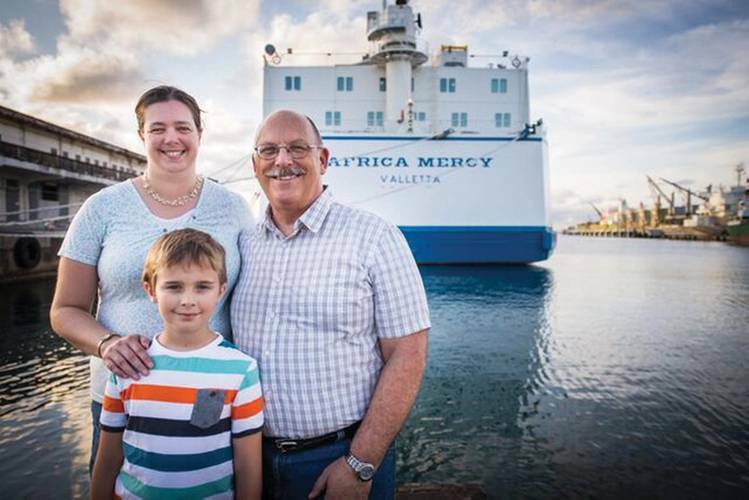 Experiences like these are the reward – not financial, but altruistic.” That’s because, at Mercy Ships, there are generally no salaries on board. Typically, all crew members find their own financial support. Tretheway’s first marine license was a 50 ton inland master with sail auxiliary endorsement, followed soon thereafter with a coastal license. Early on, he also earned an AB ticket, where, he says, you had to demonstrate some skill before a stone-faced Master Chief. Growing up on Puget Sound, Tim’s early years were spent on the water, fishing with his father and grandfather, and sailboat racing with friends. Still another family member, an uncle was a commercial fisherman, and Tretheway gained some experience there, as well. Eventually, he began to deliver boats up and down the sound, and later all over the region. Tretheway’s career took off long before STCW came into play, and he managed to qualify for some MARAD training, which predated and (he insists) far exceeded the current BST requirements. He explains, “This early training initially gave me some deferment time as STCW standards were debated and sorted out. The early STCW was not approved by the Coast Guard, which put my license at odds with some countries when I was sailing foreign at first, but the MARAD training helped offset some of these issues. With the implementation of STCW-95, Tretheway began to do all the required courses. These he had to do at his own expense. Also at that time, however, he began his service with Mercy Ships, and some of the training centers and/or instructors gave discounts. “That really helped,” he said. But, for Tretheway, it was never easy. “The challenge came when I was trying to upgrade. This was before you had to present training certificates for everything to the USCG and could demonstrate your competency through sea time and in the exam room only. I had to buy my own textbooks and supplies and design my own course to cover the material. A great friend and professional mariner stepped in to help, buying most of the study materials and textbooks I needed. Without that help, I would have had to walk away.” Along the way, Tretheway experienced countless acts of similar kindness. Tretheway steps ashore after more than 28 years – far richer than a Wall Street hedge fund trader – secure in the reward that comes with lifetime friendships and the knowledge that the world is a little bit better because he came and said ‘yes’. That’s a job well done, Captain Tretheway. Bravo Zulu from MarPro.